New Annapolis Wedding Reception Venue for 200+ — Wedding Savvy Wedding Consulting, Inc.
A view of the annapolis skyline -check! Plenty of parking - check! Lots of natural light - check! Tasteful decor that can be dressed up or down - check! Plenty of room for dancing - check! And finally, for the grand prize .. your name in lights? CHECK! Akerson Tower is a newly constructed elegant event space that sits on top of the existing stadium structure. The Tower has two rooms - North and South Tower - separated by an elegant white tiled lobby area that can be used for cocktails or for your dance party. You can rent one or both sides of the tower depending on your guest count or event needs. The event we attended was in one side and could easily accommodate 100+ for a cocktail party such as featured here. Live music makes this event filling the room with a warm ambiance that made us want to stay all night long! The rooms are nicely appointed with mahogany bars anchoring each end of the room with floor to ceiling windows lining each side. The views are breathtaking - the perfect Annapolis city skyline on one side and then the fun view of the Navy football field on the other! And yes -- this is where the name in lights comes in … you can have a picture or pretty much anything else you want on the scoreboard for all your guests to see (for an additional fee) - what fun! Not into the view of the football field (I'm talking to you, Army fans)? 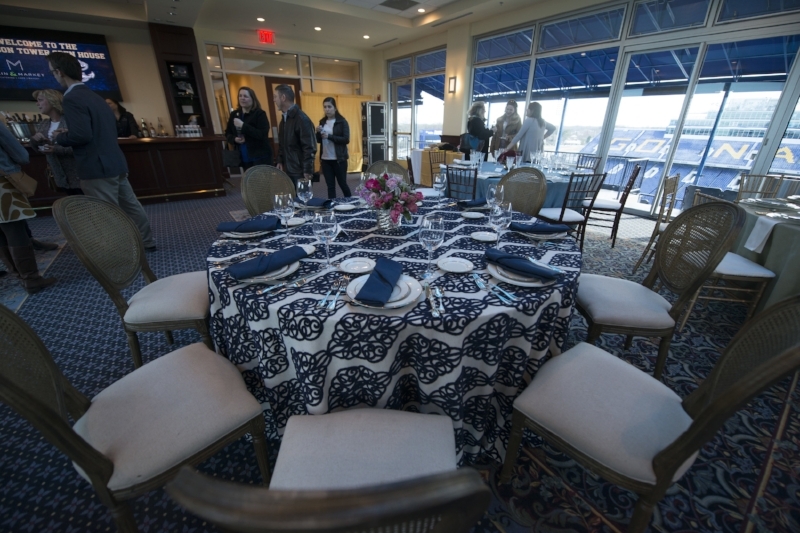 Some simple pipe and drape can block the stadium view and can be used as an elegant backdrop for some ambiance lighting and the only view left is that of the breathtaking Annapolis skyline. One of the best parts about this space is the large natural skylights. There are four on each side and is magnificent to watch the sun set and let the moon glow in for your special night. Do we sound enamored??? We are!! We have visions of an elegant, upscale, black tie affair with a 10 piece band on the white tile dance floor with a bride and groom twirling on the floor. Add in some gold chanel chairs and then some cafe lights delicately strung across the skylight openings...voila! A night to remember! We are so excited to add another amazing wedding reception venue to the list for Annapolis. If you would like more information about pricing and availability, contact Main and Market (a preferred caterer) at 410-626-0388 or contact Kris Morgenthaler of the Naval Academy Athletic Association directly at whitacre@usna.edu. Thank you to Debbie Latta for the photos of this event featured here.